MEAA welcomes the establishment of a Senate select committee that will inquire and report on the future of journalism in Australia. 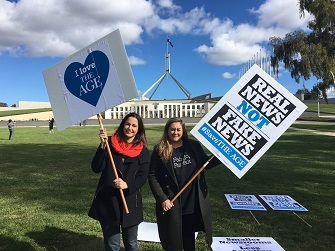 The news comes as Fairfax Media journalists have returned to work after a seven-day strike with their heads held high having highlighted the threats to quality journalism that will result if Fairfax continues with plans to make 125 metropolitan daily journalists redundant. MEAA has long called for the Government to come to grips with the crisis affecting journalism. Merely changing ownership rules will not improve long-term sustainability. MEAA CEO Paul Murphy said: “The proposed restructure at Fairfax Media, where the company proposes to cut 1-in-4 journalists resulting in the company abandoning reporting of key areas of Australian life, indicates just how serious the crisis in public interest journalism has become. Fewer journalists means fewer stories. “Public interest journalism is vital for a healthy democracy. The last week has shown there is great community concern at the potential loss of so much journalistic talent, so it is great to see the Senate will now examine the issues.” Murphy said. MEAA will make a submission to the inquiry.